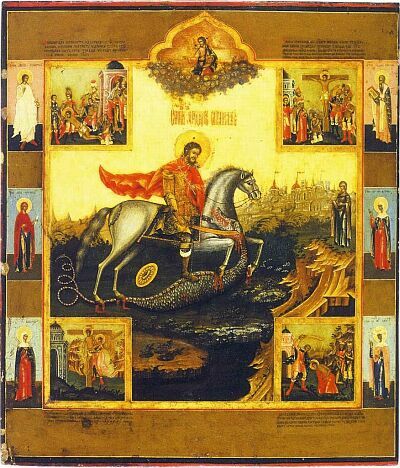 The icon of Great Martyr Theodore Stratelates with 4 scenes of his martyrdom and 6 marginal saints. The third quarter of the XIX century. Pokrov (Intercession) Cathedral on Rogozhskoe Cemetery in Moscow. 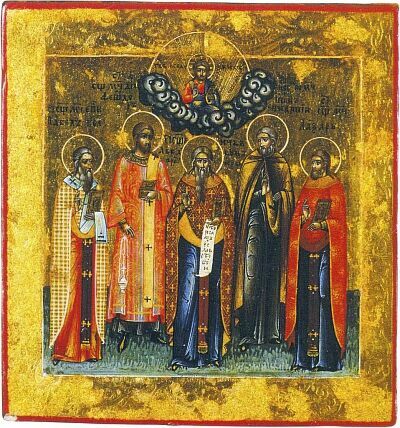 Guslitsa icon of 5 Old Believers saints: Hieromartyr Paul of Kolomna, Hieromartyr Diacone Feodor, Protopope Avvakum, Venerable-martyr Epiphanius and Hieromartyr Lazar. Late XIX century. Pokrov (Intercession) Cathedral on Rogozhskoe Cemetery in Moscow.